Two members of our International GP Recruitment team, Nicky Gregory and Vicki McLaren, recently took a trip to Australia to meet with some of our healthcare clients and also catch-up with Doctors we have previously found jobs for. It was with a mixture of excitement and trepidation that I planned my first trip to Australia – it was always somewhere I wanted to visit, but in all honesty the travelling time put me off. A round trip of approximately 20 hours to Perth literally flew by (pun fully intended) and I was happily surprised at what an easy journey it was. Flying from Glasgow to Dubai took around 7 hours, a short stopover in Dubai then 10 hours to Perth. The airport is very central and we were soon in the city centre at our apartments at around 9pm. With a busy day planned we decided to try the bolt on restaurant to the apartment, we were just looking for some quick sustenance before bed, not for the last time was I extremely impressed with the quality of food and beverages on offer in Perth. Even restaurants and bars where you would expect run of the mill fare offer an exceptionally high quality of food and service at very reasonable prices. 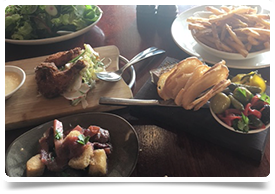 On Saturday we travelled to the GP conference where we met some clients before having some lunch at a beautiful glass-fronted restaurant overlooking Swan River at Elizabeth Quay. We then headed in to Perth city centre visiting the Print Hall and Petition (all in the name of research) before retiring for the night. At 10am we headed over to South Perth to view some practices, sampling a delicious bacon eggs benedict brunch (bit of a theme here) at Leapfrogs, great food set in a relaxed environment within gorgeous botanic gardens. We visited Wannerroo, Mindarie and Merriwa marina. The area is surrounded by lovely suburbs with stunning houses, and apartments with sea views. The afternoon took us down to Mandurah where one of our lovely clients hired a boat and took us sailing on the lakes. There were some of the most impressive properties I have ever seen backing on to the lake with their own personal jetties. Before heading home we visited Cicerello’s for a Barramundi supper, highly recommended. Although the weather was unusually cool for that time of year it did warm up towards the end of our stay to the low to mid-twenties with clear blue skies. As a Brit it appeals to me that there are seasons and although there are hot summers you will also see some rain. I wasn’t expecting the abundant greenery that the changing seasons make possible. Practices are generally located in shopping precincts, many are described as being within shopping centres however these aren’t shopping centres as we would think of in the UK with lots of shops all undercover. They are normally a small group of shops outside and often the practices are standalone. There is a variation from very modern, newly-built practices to those that have been established for a number of years and maybe aren’t so shiny and new anymore. What they do have in common is that they are all equipped to a very high standard. Most consulting rooms have windows however not all, so if this is something that it is important to you it is definitely worth checking. Our next day was spent visiting practices in the Northern suburbs, including Butler, Clarkson and Brighton Beach. You can easily live in Perth CBD and commute, or you could live by the beach, or have a house with a pool in one of the many suburbs. One of the things that struck me about the suburbs was that there is a real community feel, with lots going on during the work week. Perth does have a large city centre however families wouldn’t need to be based there to be have a busy social life. No matter where we went the coffee was superb, and sitting in Butler Café looking at beautiful blue seas and white sandy beaches is a lovely way to spend a lunch or tea break. As well as a fantastic food scene getting outdoors is obviously a huge part of Perth life, there are lots of independent 24 hours gyms and people running, cycling etc. 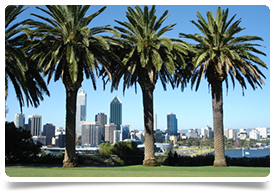 Driving around Perth you are never very far from a beach or water and the traffic was pretty quiet as most people tend to live within a 20-minute commute to work, meaning those that live in the city and work outside aren’t caught up in heavy peak-time traffic. 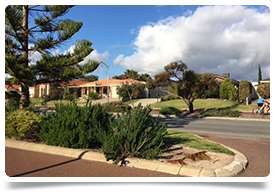 That evening we visited a UK GP who had recently relocated with her family to Cottesloe. She is currently renting a grand detached 4 bed property and was surprised at how reasonable the rental was saying it was far more impressive than what the same money would get in the UK. 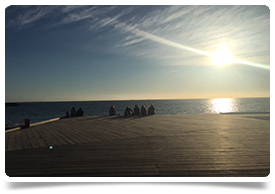 On Tuesday we visited Rockingham, Baldivis and Port Kennedy – more beautiful scenery and the opportunity to work and live close to the beach. 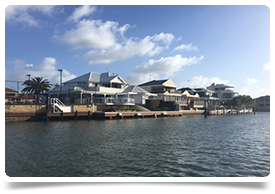 Port Coegee boasts a stunning marina and beach, there is lots of building going on in Perth and a wide range of properties available to cater to all tastes from grand villas to stylish new apartments. Fremantle has lots of older buildings and character, and is well known for its eclectic mix of residents. The latest Lonely Planet guide has ranked Fremantle as the 7th-best city in the world. Another super feed at Little Creature’s micro-brewery while looking out to sea rounded off a busy day nicely. We drove south the following morning back to Mandurah, Bunbury and Busselton before heading to Margaret River for the weekend. Bunbury and Bussleton are more laid back and slightly quieter, creating a relaxed atmosphere and would be a great location for families looking for a short commute. 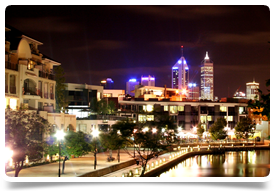 Bunbury is a cosmopolitan city renowned for wild but friendly bottlenose dolphins which you can meet at the shoreline or out in the bay aboard a dolphin watching and swimming tour. We didn’t see the dolphins however we did go whale watching – unfortunately we were too busy watching these majestic creatures to get any good shots! A trip to Margaret River is a must for anyone who visits Western Australia – the area is well known for the quality of its cuisine and wine. We felt immediately relaxed upon arrival, it’s a real mix of age groups from young hipsters to families and silver surfers. Swings & Roundabouts is well worth a visit for rustic, stylish dining and again superb food and service. The next morning it was croissants and coffee before heading off for some free wine tastings at Xanadu Wines, which was recommended to us for its food and we had lunch in a large open-plan restaurant with windows all around where you could enjoy views of the vineyards. That evening we headed back to the Main Street where we listened to live music. On Sunday we visited Ngilgi Caves, a 500,000-year-old cave system associated in Wardandi spirituality with the victory of the good spirit Ngilgi over the evil spirit Wolgine. Formations include the white Mother of Pearl Shawl and the equally beautiful Arab's Tent and Oriental Shawl. Next on our list was the Underwater Observatory, recently named #1 on the list of top aquariums in the South Pacific by reviewers on Trip Advisor. This was followed by an obligatory trip to Margaret River Chocolate Company, where those with a sweet tooth like me will find it impossible not to try the free samples or leave empty-handed. To find out more about living and working in Australia, read our handy GP guide.